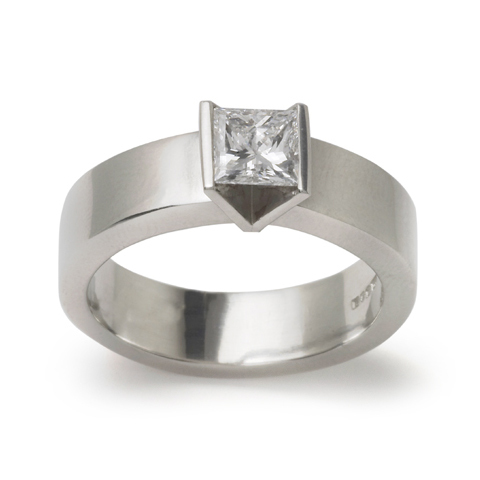 1ct Princess Cut Diamond & Platinum Ring: Handmade platinum engagement ring with a thick rectangular shank set with an FVs2 GIA certified 1ct princess cut diamond in a V setting that clasps the diamond to look like a tension setting from the top allowing a good side view of the diamond from the front. Also available in other metals and with alternative stones to meet most budgets. Made for you in our jewellers workshop on the crossroads in Ditchling, East Sussex.